The Air Force Association William J. 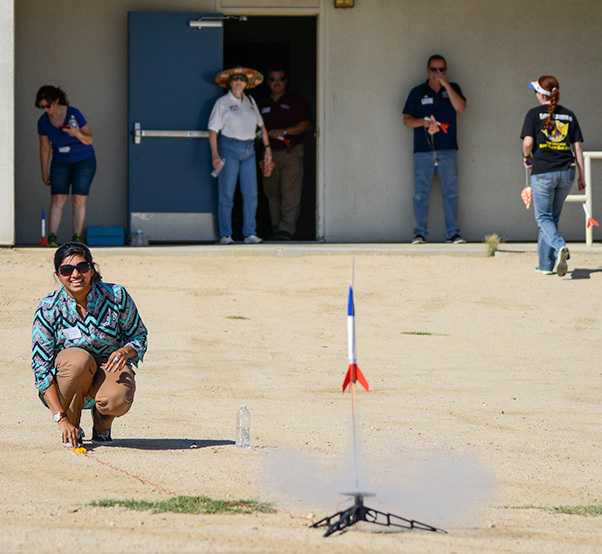 “Pete” Knight Chapter introduced Antelope Valley educators to using model rocketry in the classroom Sept. 26. 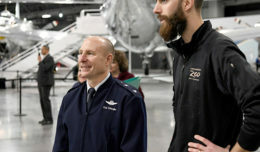 Teachers of grades six through 12 gathered at the U.S. Air Force Test Pilot School for the inaugural “Blast off Basics” workshop. 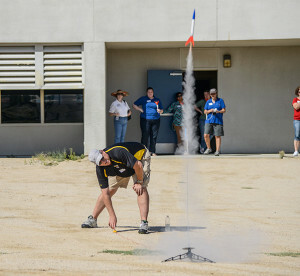 “The purpose [of the workshop] is to make teachers comfortable with using model rocketry in their classroom,” said Megan Tucker, workshop coordinator. In the morning participants listened to presentations on NASA’s current mission to Mars and Space Camp. Then the teachers split up by grade level into two rotating groups. While one group listened to a history of rocketry, the other group got to fly the TPS remotely piloted aircraft simulator. At the RPA simulator, the teachers were paired off to fly an unclassified MQ-9-like simulator. While one flew the aircraft, the other was assigned to the sensor operator station. According to Randy Kelly, TPS systems master instructor and AFA member, the simulator aircraft model he chose for the workshop required them to work together to effectively use the equipment. 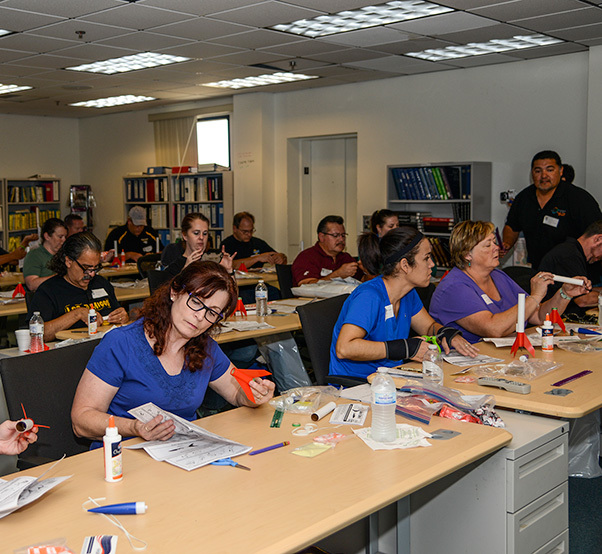 Each participant to the workshop was offered a complimentary membership to Civil Air Patrol (CAP), which included free curriculum guides and STEM kits. STEM is Science, Technology, Engineering and Mathematics. Megan Tucker, workshop coordinator, demonstrates what happens after the rocket launches. “They’re getting at least over 50 different curriculum guides, not lessons. Each guide has about 25 lessons free,” said Tucker. According to Tucker, there are several types of STEM kits available to the teachers at no cost. They are only asked to take pictures and write a paragraph about what the students learned using the kits. There are model rocketry kits, flight simulators, astronomy kits and even model remote control planes. During the lunch break at the workshop, the teachers heard from 1st Lt. Arcenio Muniz who works at the Air Force Research Laboratory. Then it was time to build their own “Make it, Take it” rocket to launch at Branch Elementary School. The rockets were provided by the AFA and a second rocket provided by CAP Aerospace Education was in a “swag bag” to take home. 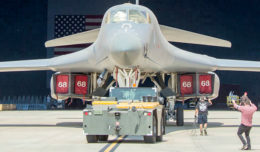 The goodie bags also contained donations from the 412th Test Wing, NASA, the Air Force Test Center, Aero Club, 412th Maintenance Group, Club Muroc and several aerospace companies in the Antelope Valley. Tucker, who did much of the curriculum development for the workshop, designed it to expose teachers to “the plethora of free rocketry curriculum that already exists.” She hoped to leave them comfortable with the process of building and launching a simple model rocket so they could modify the lesson to suit their specific grade level. The inaugural “Blast off Basics” workshop for teachers of grades six through 12 was held at the U.S. Air Force Test Pilot School Sept. 26. In attendance were teachers from Branch Elementary School, The Palmdale Aerospace Academy, Rosamond High School, Paraclete High School, Knight High School, Challenger Middle School, Lincoln Elementary and Discovery School. For more information on incorporating rocketry in the classroom contact Megan Tucker at mtucker@tpaa.org. 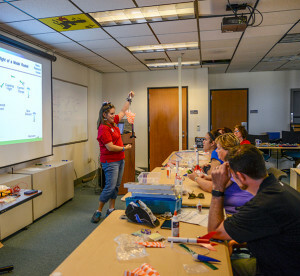 The “Blast off Basics” workshop was designed to make teachers comfortable with using model rocketry in their classroom by giving them a chance to learn about model rockets, build and then launch one. The Air Force Association (AFA) William J. “Pete” Knight Chapter invited Antelope Valley educators to a workshop where they learned about using model rocketry in the classroom Sept. 26. The workshop ended with a model rocket launch at Branch Elementary School.